Supergirl Pilot – I didn’t like it. 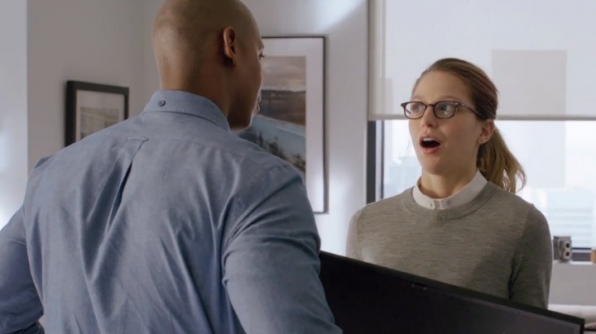 Well, I finally got around to watching the Supergirl Pilot off of my DVR tonight and I’m going to have to be honest, I really didn’t like anything about it. I know the reports were that a lot of people tuned into watch the first episode but will they come back to see the second? The third? Honestly I’m not really interested, and even though I’m going to record it, the rest of the episodes will probably set on my DVR until the end of the season. I don’t like any of the casting on the show as of right now. Especially the lead actress, and her one thousand and one stupid faces. Maybe she just has one of those faces that makes you want to kind of punch her in the throat a few times. Or it might just be me. To be an adult working woman she comes across as very stupid and childish. She can’t pick out an outfit to wear on a date without her sister’s help? Really? Looks like they are setting up a cheesy romantic sub-plot with her mooning over one guy while the other guy moons over her. I would be delighted to be found wrong about this subject. Horrible pacing on the pilot episode jumped around all over the place. Why not just start her out with an action scene and tell her history in flashbacks? Powering through her lengthy origin story in such a linear fashion was boring and doesn’t let you connect with her character on any level. I think the premise of the Kryptonian jail falling to earth wasn’t that great and will just lead to a bunch of monster of the week episodes. It doesn’t make sense that Superman isn’t around. Just the way they explain him not being around doesn’t make any kind of good sense at all. Obviously this probably has something to do with copyrights and who owns the rights to what but still, give us a plausible excuse as to why he isn’t there. Anyway, I don’t really have anything good to say about any of it at this point. Maybe it will get better a few episodes in but I’m not going to hold my breath on this one.